It gives me great pleasure to join you for the fourth Public Sector Day, which is an occasion to highlight the valuable partnership provided by the public sector in our country’s economic progress. Today, as we recognize select Central Public Sector Enterprises (CPSEs) for attaining excellence, it is also a time to reiterate our commitment to strengthen the public sector. I compliment the Department of Public Enterprises and the Standing Conference of Public Enterprises (SCOPE) for organizing this important event. Our Constitution has been the guiding light to our approach to public sector. The people of India resolved through the Preamble to secure political, economic and social justice to all its citizens. A Directive Principle of State Policy is that and I quote: "the ownership and control of the material resources of the community are so distributed as best to subserve the common good” (unquote). CPSEs have been the critical support system of India’s economy. When we launched our First Five Year Plan, a healthy socio-economic scenario eluded our new nation. Modern technique in industry was limited by its use. Agriculture was depended upon by 70 per cent of the population that led to a decline in the size of farm holdings and farm productivity. The rural population comprised 83 per cent of the country’s population and suffered from chronic underemployment and low income. Population growth during the first five decades of the 20th Century was more than 50 per cent but employment generation was not enough to take care of this demographic expansion. Rapid economic development called for industrialization, creation of employment and infrastructure, balanced regional development and stable prices. To develop industry, private capital and entrepreneurship was lacking. Today, private corporate sector savings comprise 7.2 per cent of GDP. In 1950-51, it was a mere 0.9 per cent. The public sector became the natural choice as the instrument of development. The centrality of the public sector in our development process was underlined by the Industrial Policy Resolutions of 1948 and 1956. The 1956 policy was unequivocal in prescribing a leadership role for the public sector. It stated that "the State will progressively assume a predominant and direct responsibility for setting up new industrial undertakings and for developing transport facilities”. Development priorities continued to expand. Sectors like education, health and environment needed greater public investment. A paradigm shift in the focus of governance, from producing goods and services to facilitating production came to be increasingly recognized. With the development of the capital market in India, the risk taking capacity of private entrepreneurs increased as they found it easier to raise resources. Capital-rich, technologically advanced and globally competitive private players came to occupy a prominent position in the industrial landscape of the country. These developments led to an appraisal of the portfolio of Government investment in the public sector. The Industrial Policy Resolution, 1991 defined certain priority areas for growth of CPSEs such as essential infrastructure, exploration and exploitation of oil and mineral resources, and defence equipments. Reform measures, especially in governance structures of CPSEs, were initiated to meet the challenges emanating from lack of market orientation, functional autonomy and competitiveness. Managerial and commercial autonomy has been devolved on the profit-making CPSEs through the scheme of Maharatnas, Navratnas and Miniratnas. There are 7 Maharatnas, 14 Navratnas and 68 Miniratnas today. I am happy to note that Bharat Heavy Electricals Limited and GAIL (India) Limited have been accorded Maharatna status recently. I urge upon the Navratna, Miniratna and other CPSEs to continue to improve their performance and meet the criteria for the next level of autonomy. These measures, by providing the operational flexibility to respond quickly to market, will improve their performance. Autonomy and accountability are two sides of the same coin. Autonomy should be matched by adequate accountability. Mechanisms such as Parliamentary supervision, audit by the Comptroller and Auditor General of India, Government representation in Boards and the Memorandum of Understanding between the government and the management specifying performance targets every year, have yielded positive results. Listing of CPSEs on the stock exchanges could be an additional layer of accountability. It would also serve as a vehicle of market orientation. There are 50 listed CPSEs. Many unlisted CPSEs have the capacity to meet the listing norms. I am sure that many of them will approach the capital market in the future and avail of the benefits of listing. The potential to unlock value through listing is high. For instance, the listing of Coal India Limited through a 10 per cent disinvestment of Government stake in October, 2010 that realized Rs. 15,199 crore was the biggest initial public offering in India. Evolution of the public sector reflects the story of India’s economic progress. The public sector started as the chosen instrument of the Government to usher in economic development. Economic advancement led to an increasing presence of the private corporate sector, with agile entities running on advanced techno-managerial practices. This process has also been aided by our policy of opening many sectors to foreign investment. The Government became comfortable in withdrawing from sectors that could be served well by the private sector. Continuity with change has been the hallmark of India’s industrial policy. To build social sector assets like rural housing and rural energy, it will be necessary to adjust the Government’s investment portfolio so that fiscal balance is not unduly stressed. This approach will reinforce the 1991 Industrial Policy that called for a review of the investment portfolio in the public sector. Our economy today is the third largest in the world on purchasing power parity basis. It has the space and the need for co-existence of both the public and the private sectors. Measures to enhance competitiveness of our public sector have shown good results. Many CPSEs have successfully competed with the private sector and come out winners. ONGC stands now as the most valuable company in India. Five CPSEs – ONGC, NTPC, Coal India, GAIL (India) and BHEL – besides State Bank of India, form part of the benchmark index, the S&P BSE Sensex. The growth of our public sector is truly remarkable. From 5 CPSEs with a total investment of Rs. 29 crore on the eve of India’s first Five Year Plan, there are 260 CPSEs with a total investment of Rs. 7.3 lakh crore as on 31 March, 2012. The performance of CPSEs in 2011-12 gives us a big reason for cheer. Total income of CPSEs at Rs. 18.2 lakh crore is 34.8 per cent of India’s GDP. Foreign exchange earnings of CPSEs at Rs. 1.2 lakh crore is 8.5 per cent of India’s total exports. CPSEs contributed Rs. 1.6 lakh crore to the Central Exchequer by way of taxes, duties, interest on loans and dividend. This amounts to 21.4 per cent of Government of India’s revenue receipts. The growth potential of CPSEs should be strengthened by greater investment, faster expansion and technology up-gradation. The total cash and bank balance of CPSEs as on 31 March, 2012 was Rs. 2.8 lakh crore. This indicates their potential to make investments for capacity expansion and strategic assets creation. CPSEs should up-grade their technology models through increased foreign collaboration. They should target greater overseas investment to enhance their scale of operation and market reach. I am happy to note that our CPSEs are active in pursuing overseas investment projects. I am told that ONGC Videsh Limited participates in 30 exploration and production projects in 14 countries. Five leading CPSEs have formed a joint venture, International Coal Ventures Private Limited, to acquire coal assets abroad. 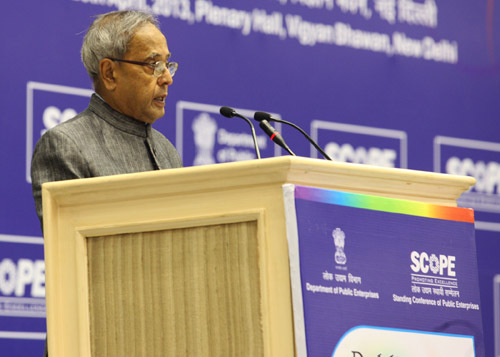 CPSEs should lay emphasis on corporate social responsibility (CSR) initiatives. The Companies Bill, 2012 passed by the Lok Sabha states that a company having net worth of Rs. 500 crore or more, or turnover of Rs. 1000 crore or more, or net profit of Rs. 5 crore or more, should spend at least 2 per cent of its average net profits in the three immediately preceding financial years towards CSR. Many CPSEs occupy major portions of towns and cities. Greenfield CPSEs have set up industrial townships. These CPSEs should concentrate on CSR activities in the fields of health, education and environmental up-gradation. There should be no room for limitations in the public sector. It is a matter of concern that there were 66 sick CPSEs in March, 2012. Though the number of such CPSEs has declined over the last few years, much more needs to be done to revive, strengthen and modernize these sick units. The recommendations of the Board for Reconstruction of Public Sector Enterprises have to be acted upon for speedy recovery and prevention of sickness. The public sector has been firmly behind our country’s progress. I am confident that it will continue to grow in strength and touch greater heights in future and meet the expectations of the nation. I congratulate all those who have been bestowed with the SCOPE Meritorious Awards for their outstanding performance. My best wishes are with you all for greater success in future.